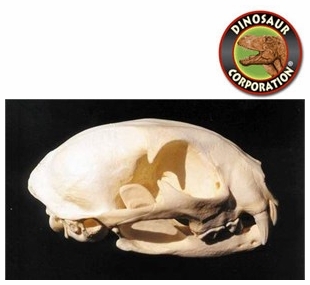 Bobcat skull replica is cast from original specimen. Bay Lynx. Lynx rufus. Felidae. The bobcat (Lynx rufus) is a North American mammal of the cat family Felidae, appearing during the Irvingtonian stage of around 1.8 million years ago (AEO). With 12 recognized subspecies, it ranges from southern Canada to northern Mexico, including most of the continental United States. The bobcat is an adaptable predator that inhabits wooded areas, as well as semidesert, urban edge, forest edges, and swampland environments. The bobcat is believed to have evolved from the Eurasian lynx, which crossed into North America by way of the Bering Land Bridge during the Pleistocene, with progenitors arriving as early as 2.6 million years ago.